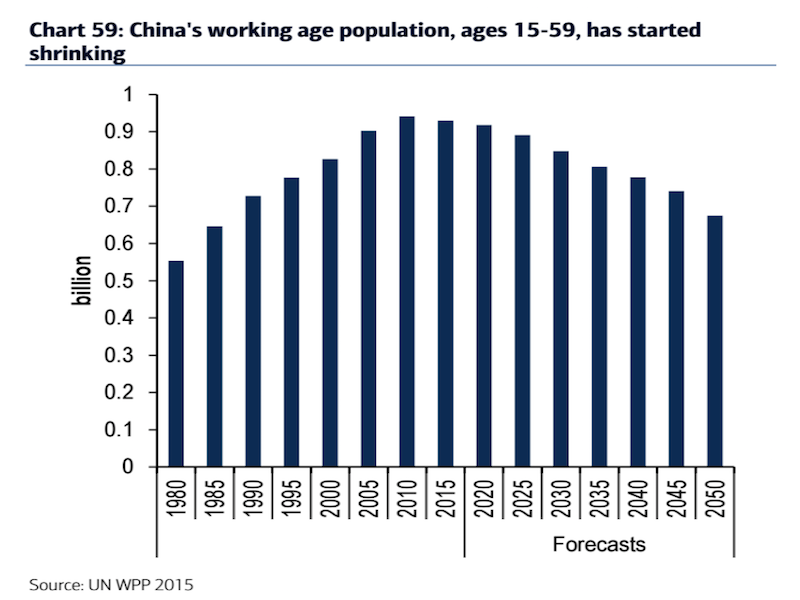 China has a looming demographics problem. The country’s elderly population will keep growing over the next several decades, while its working-age population will keep shrinking. In a recent note to clients, Deutsche Bank’s chief international economist Torsten Sløk shared a pretty scary chart showing just how significant this change will be. The chart shows the old-age dependency ratio, or the ratio of workers to retirees in the country, from 2000 going into 2050. As you can see below, the line dips significantly. And by 2040, the ratio is projected to drop to 2 — that is, just two workers for every retiree. However, this isn’t a new insight; many analysts have written at length about this looming crisis. 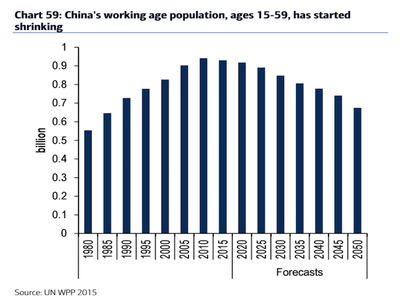 Earlier, a Bank of America Merrill Lynch team led by Beijia Ma shared a chart showing that China’s working-age population — aka people 15 to 59 — has already started shrinking and is set to continue to decline. For China to rise to be the world’s #2 economy, the country saw its working-age population expand by 380mn people between 1980 and 2015. During this time, millions of people from rural China migrated to cities for urban manufacturing jobs. While this has pushed China to be the world’s largest manufacturing economy in 2010, it is expected to peak in 2017. 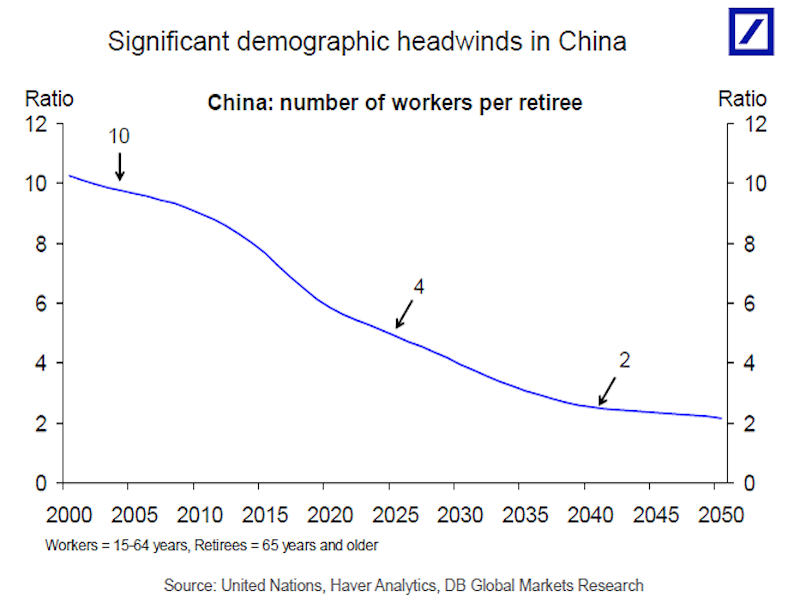 And on top of that, China’s enormous population means that, in absolute terms, the country will have a huge number of people aged 65 and up in the coming decades. In 2015, the number of older people in China (136.9 million) exceeded Japan’s total population (126.9 million). By 2030, Japan and Egypt’s combined total projected populations (231.8 million) will be smaller than China’s projected 65-and-up population (238.8 million). And by 2050, China’s projected older population (348.8 million) will be approximately equal to the combined total projected populations of Japan, Egypt, Germany, and Australia. 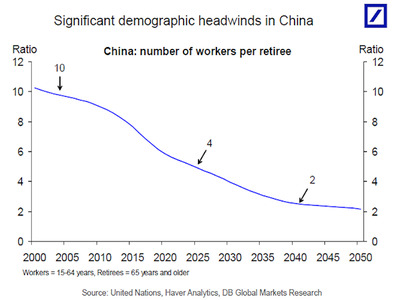 In short, China’s going to have a lot of old people and far fewer working aged ones.